Moon Magic FC is an American Hattrick soccer team from the Boston region. The team competes in V.115 and plays their home games at Magic Park. The club is well known in the New England area because of the extensive coverage it receives from tabloids. The youth academy, Magic Academy, is famous internationally for its great success in the Bottom Division Federation youth pyramid. Magic Academy is, and has always been in the top division, the MARS-League. Despite the club's prestige and massive fan base, Moon Magic curiously fired the wonderful public relations firm responsible for the recording its history on this very page which has left us with no reason nor motivation to continue updating it. During late 1880s and up until the late 1920s Moon Magic FC was one of the most storied and intimidating clubs in the world, if not the entire galaxy*. The club won many honors and fans with their clean image and charming smiles. In 1926 they became the first club to float on the stock exchange which brought a windfall of revenue that resulted in a historic and short lived period where Moon Magic FC bought every player in the world with a national team cap. Many teams across the world could no longer field teams that could play the game with beauty or even skill. Moon Magic, with a roster well above 900 players, was on top of the world and millions of fans tuned in on their radios just to listen to scrimmages. Other clubs complained because of this "unfair" advantage and hired mediums to curse Moon Magic. The curse would not set in for a few years, but when it did, it took its toll. In 1929 disaster struck the American stock market. Moon Magic's stock plummeted and they could no longer afford their expensive roster. The club was forced to declare bankruptcy and reformed as an amateur side in 1934. Little is known about the team from that point on, besides the present day reformation. A majority of Americans still believe that it was entirely the fault of Moon Magic's monopolistic ways (and the curse that followed) that caused the Wall Street Crash of 1929 and the Great Depression that followed. This is debatable because the Cygnus Arm giants, RS 9881, also had similar success according to journal translations. After centuries of amateur obscurity Moon Magic was bought by a mysterious and tyrannical individual who, through his allegedly illegal government connections, has managed to keep his identity a secret. All that is known about him (by means of recovered sexual harassment documents) is that he is indeed male. Years of tenuous paper work followed, but in season 30 Moon Magic FC was granted admission into the American Hattrick pyramid and they joined series VI.101. Moon Magic then hired the famous Bosnian commentator and television personality, Srećko Trman. Trman, beloved in his homeland for his quirky style and poor grammar, had no prior soccer experience and it is unknown how he managed to become a soccer commentator in the first place. Despite these short comings, he was unveiled to three Moon Magic supporters at Magic Park at a much hyped press conference days before the season started. Trman's hiring was not without controversy. Many suspected he could not speak English and they wondered how he would manage an American squad. As it would turn out, these suspicions were well founded, Trman could not speak English, he spoke only a non sensible combination of Bosnian, Serbian and Croatian. The first two seasons of Trman's reign were not successful. Srećko Trman had enacted a 'no English speaking' policy which left the squad, mostly American, no way of communicating with each other on the field or during practice. Moon Magic finished 6th in the league during seasons 30 and 31. Trman was under heavy pressure by Moon Magic supporters and they demanded results in season 32 or, as some claimed, they would punch him in the eye. Trman took these threats to heart and prior to the start of season 32 he declared now that he had "mastered English's of words" that Moon Magic would find success. Seasons of non-vocal communication had created a deep bond among the Moon Magic players and with the no English speaking policy lifted, Moon Magic stormed through their series during season 32. After falling from the poll position in week 6, Moon Magic went on an eight week unbeaten run in which they won back to back Boston derbies against the Boston Red Sox and defeated series rivals Coral Cove FC. In week 11 Moon Magic would regain the top spot, as Coral Cove dropped points to Raleigh United, just days after Coral Cove had claimed they already had "one hand on the title". The remaining weeks were not for supporters weak of heart as only one point separated Moon Magic and Coral Cove. Moon Magic would not stray from the path, trouncing teams that attempted to stand in their way. In the final week Moon Magic would have to play top 3 side Raleigh United, a team that had thrashed Moon Magic by four goals in the first week of the season. Cove had already secured their three points thanks to a forfeit. The pressure was solely on Moon Magic, especially after they gave up a soft goal in the opening minutes of the game. A sold out crowd looked on in despair, wondering if now was the time to swallow the pregame giveaway of limited edition Moon Magic percocet pills and end their suffering. But Moon Magic would respond triumphantly with a two minute double salvo by strike force Don Barger and Billy Ray Hays to take the lead. Moon Magic would continue to pile on the pressure with an astounding 74% possession in the second half. Magic fans watched time wind down and Moon Magic prevail, winning their first trophy of any kind in over seven centuries. After Moon Magic's championship season, expectations were high for a repeat performance. Many supporters demanded another championship and sent many death threats to Srecko Trman to follow through. All seemed fine when Moon Magic won their first ever cup game, dominating the Michigan Huns on their own ground 5-2. The first game of the season followed a few days later where Moon Magic lost shockingly to the last season's runner up, Coral Cove FC. The club dominated both halves of possession but would still go on to lose 1-2. Moon Magic then lost their cup game to C.D. Gualleros 0-4. Things were looking bleak for Moon Magic and the season was almost lost on four separate occasions of near misses on Trman's life by professional hitmen. These hitmen would later testify to being 'Cove supporters' and that they intentionally failed their assassination attempts to sabotage Moon Magic's season. Things would turn around as Moon Magic won their next 8 games. This gave many supporters hope that Magic could nick the title, but as it would turn out this was only fate's attempt to bring greater despair onto Moon Magic by teasing the club with a taste of hope. The club lost its next home game to Raleigh United despite a fine performance and followed that up with a boring 0-0 draw at the Boston derby against the Boston Red Sox. With these performances, Coral Cove had all but won the championship with three games to play. In a shameless effort to propel Coral Cove into an auto-promotion spot, Moon Magic fielded a team of old immigrant workers in their final game of the season against their rivals and lost 0-10. As Magic's luck would have it this would not be enough to send Coral Cove into series V and the Cove boys would choke in their qualifier. Trman was given one final chance at the start of season 34 but Moon Magic FC lost 0-2 to their bitter rivals, Coral Cove FC, and Trman was fired. As expected, José Antonio Albelda was announced as the next manager of Moon Magic FC. The local press supported Albelda enormously as he was from a proper footballing nation, Spain, and not some "hick country like Bosnia that hasn't ever qualified for a proper international tournament." The Bosnia and Herzegovina Magic Supporter's Group responded to these ignorant remarks with fatal fury and asked those who bashed Trman to acknowledge he had brought the club their first trophy in modern history. Never the less, Albelda has proven to be quite popular among the fans due to his frank and sexual nature. After one match he asked an attractive female Moon Magic beat writer to take off her top and she did so quite willingly. An uncut video of this, which spread like wildfire on YouTube, gained Albelda a worldwide following for his prowess. He proved to be competent on the field as well and guided Magic to a 13 game unbeaten run to finish out the season. This run concluded with a 5-1 smashing of Coral Cove that prevented them from another title. That game also clinched Jackie Crouch his first Golden Boot as he scored 4 goals to finish the season with 16 goals, one above teammate Billy Rays Hays. Trman's damage would be impossible to overcome though and Moon Magic missed out on the title by 2 points, finishing 3rd. In season 35 Moon Magic quickly showed the progress they had made under Albelda. The club won their first four matches including a 4-3 win over rivals Coral Cove FC. The team kept pace with F.K. APOLONIA who went on a run as well. However, Magic were the first of the two to lose, with a bitter 1-2 defeat against Tiko Ttrick, previously known as BENS CARPET. APOLONIA would draw though, leaving Magic only a point behind the leaders. This loss opened Albelda's eyes to one area of the team he had left begging, the defense. It is well known Spanish people do not like defense, and in a sort of mutual agreement, no Spanish teams play defense. But Albelda saw how costly that tactic would play in America and quickly remedied it. He signed two defenders that week, ironically they were both Spanish leading some to question whether this historian is making certain things up. The two players, Adolfo Sangiao and Santiago Figueres, both said that the main motivation behind their signings was the Moon Magic FC Music Entertainment Record Label that had been announced just the day before. Both love to sing and both want to record their songs. However, these signings, along with a slightly earlier signing of Spanish U20 prospect Eutelo Roel, have led certain fans to question whether their team will remain American at heart, or if Albelda will continue to favor buying Spanish talent. In spite of these questions there were more important issues at hand. In weeks 7 and 8, Moon Magic would face off twice with league-leading F.K. APOLONIA and a single misstep could end the club's title hopes. Moon Magic would have to face off against APOLONIA away, but won against the odds, 1-2 with a goal from Jackie Crouch and the winner from the newly signed defender Adolfo Sangiao. This win sent Moon Magic back to the top of the table with APOLONIA and Tiko Ttrick both two points back. Moon Magic now had a job to do at home. The match sold out, the second sell out of the season, and the supporters were certainly entertained. In the 26th minute Academy boy Clifton Lovell recorded his first senior club goal, "finishing off with a half-volley shot just below the bar". Don Barger followed up with another goal 5 minutes later. Billy Ray Hays sealed the deal with a third goal in the 58th minute ensuring a 3-2 Moon Magic win. The club was now in control of its title hopes. However, those hopes were seemingly dashed only two weeks later when Tiko Ttrick came back from a Jackie Crouch hat trick to win 4-3. Unfortunately it looked like Moon Magic would not take home a winner's medal this season. But unlike F.K. APOLONIA who faded after Magic dashed their dreams, Moon Magic held on strong and did not give up. They won their first ever match at Skinner's Park, 1-3, to continue their win streak against Coral Cove. The next week, the unthinkable happened and Tiko Ttrick lost to F.K. APOLONIA! Moon Magic were back in first! The club only needed to win the Boston derby to bring glory back to Boston. The match started off well for Magic as Crouch put the club up 1-0. At this point, the Red Sox clearly lost all the class they had and changed tactics. Red Sox players were now playing dirty as they tried to injure every Magic player on the field. The first victim was Clifton Lovell, an attack that injured him for 5 weeks! The next was superstar Spanish defender Santiago Figueres, a 4 week injury. The referee had clearly been paid off and there was nothing Magic could do to cope with these injuries. To their horror, the Red Sox, now playing a crippled Moon Magic team, scored two goals and won their second Boston derby 2-1. As karma would have it, Moon Magic still enjoyed the glory of a league championship as Coral Cove managed a draw against Tiko Ttrick. Season 36 started off with a delightful 0-9 cup win followed by a win over the mighty Tiko Ttrick, a team Moon Magic FC had not beaten in over two seasons. Don Barger and Billy Ray Hays scored back to back goals late in the game, a heroic performance that will always be remembered as Moon Magic FC Music Entertainment awarded the duo the club's first record deal. Meanwhile, Albelda signed four exciting prospects for Global Magic. Russian prospect Boris Kochkin in particular signed to take advantage of Moon Magic's expert vocal coaches in hopes of curing his rising larynx which has plagued his singing voice and had stolen his motivation to live. Moon Magic were perfect, winning all 14 games and giving up only 9 goals. This secured automatic promotion and the excitement to new competition. Moon Magic were promoted to V.115 for season 37 and the club picked up where it had left off in VI and delivered a dream season to supporters. Moon Magic won the title in its inaugural V campaign and Don Barger won the Golden Boot with 17 goals. Season 38 would be a reality check as V.115 across the board strengthened to keep Moon Magic at bay, and they did. The club finished in 6th, but ended the season with a 7 points in its last three games, giving hope to a better tomorrow. The club plays in royal purple and neon carrot striped shirts. These colors were inspired by a postcard the chairman received while vacationing in Malta. The postcard featured a golden hue picture of the infamous acrylic on canvas painting Voice of Fire by Barnett Newman. The chairman became infatuated with the painting, and used up the entirety of the club's transfer budget, $10 million (controversially more than 5 times the asking price of the National Gallery of Canada), to purchase the painting and showcase it at Magic Park. 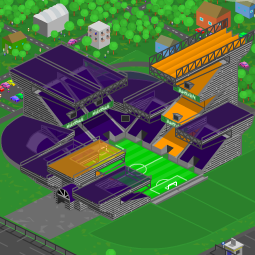 The painting took months for the club to receive and by the time it arrived the club had locked itself into their current royal purple and neon carrot colors. It was not until after the painting finally arrived did the chairman realize his grave mistake, the painting's colors actually resembled something more like blue and red than royal purple and neon carrot, but it was too late. The painting was unveiled before a non-existent audience as many supporters believe the painting symbolizes the power the chairman has to crush dreams and promote despair. 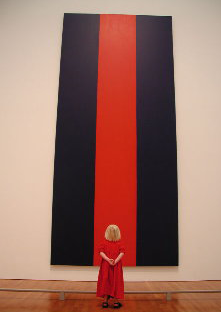 Mere weeks after the painting's unveiling, a four year old girl and visiting team supporter put her used gum on the bottom of the painting causing irreversible damage and causing the painting's value to depreciate immensely. Moon Magic's original crest was a simple, royal purple, circle with a neon carrot rampant tiger in the middle. This was, allegedly, in homage to the original Moon Magic FC of old, but no known photograph of the old crest is known to exist, leaving this claim unverified. In the middle of season 32, after a huge sale on all Moon Magic items, the club announced a new crest forcing loyal supporters to buy all of their club apparel again but at a %200 mark up. The new badge was created solely by the chairman (who has made no mention of any kind of background in graphic design) and he revealed it in announcement that most of the club officials (bar the president of marketing, Timothy Mann) were completely unaware of. The new crest features Moon Magic's Voice of Fire stripe behind the tiger rampant. Moon Magic Football Club was abbreviated to MMFC and for the first time the club introduced the legendary purple moon, the "Magic Moon" that the club was named after. In the press conference Timothy Mann said that the chairman called the new crest, "a masterstroke of brilliance by a genius the world has never before seen." It is unknown whether or not the chairman told Mr. Mann to make this statement knowing that the fans would realize the chairman was talking about himself. Moon Magic FC play their home games at Magic Park, a state of the art stadium built in season 30 that currently holds 29,000. Magic Park is popular hang out place for the younger crowd, supporter or not, as the club obtained permission to serve minors alcohol. Many authorities question the legality of such a practice and rightly so as it is against the law. Magic Park still continues to serve to minors today because any complaint is often lost during processing. Many suspect that this is because the mysterious CEO of Moon Magic has obtained the Rod of Empowerment which renders mere mortals useless against its influence. Although, some ask why hasn't the chairman used this to give the club an advantage on the playing field. The chairman's motives remain a mystery to this day. Magic Park, originally holding a capacity of 12,000, was expanded to 16,000 at the end of season 32 because of significant ticket demand. In a strange move, the entire stadium was destroyed and rebuilt from the ground up calling some fans to question if it truly was an 'expansion' or if this term has simply been tacked on to escape the luxury tax of building a new stadium within ten seasons of the prior stadium's completion. In an even more bizarre turn of events the club was given a $25,000 rebate by the HFA creating even further suspicion that Moon Magic's chairman is in possession of the Rod of Empowerment. Defendants of the chairman cite examples of thousands of other clubs receiving the same rebate and they cannot all be in collusion with the bearer of the Rod of Empowerment. Prior to the start of season 34, Magic Park was expanded once more. An additional 5,000 seats were added, bringing the stadium's capacity up to 21,000. The expansion was not without controversy. Many fans protested that the placement of the new seats was nonsensical. This is because the new seats were added to the top of middle of the Copper Sky stand and many fans had hoped the new expansion would create a stand behind a goal. The Copper Sky stand has been infamously called the 'Erection stand' due to the substantial growth observed in its middle region. After Moon Magic's title in season 35 greater demand for tickets meant another expansion. This time Magic Park added 8,000 new seats in a new stand behind the goal. This brought the stadium's capacity up to 29,000. The new stand, called the Sniper Stand, is a steep stand meant for true fans of the club. And when the club means true fans it means fans that are willing to throw things, such as glass bottles, batteries and minor explosives at the opposing keeper during a Moon Magic build up. Each seat in the Sniper Stand is equipped with several projectiles and is replenished for every match. Moon Magic won another title the next season and also promoted out of VI.101 and into V.115 which meant much larger crowds. To satisfy demand the club added another 8,000 new seats bringing capacity up to 37,000. In doing so the Sniper Stand was expanded by nearly 50% and the corners were filled to keep the sound from escaping that side of the stadium. In past seasons the club's biggest rival was undoubtedly the Oregon-based Coral Cove FC. The rivalry, otherwise known as the East Coast-West Coast War, was one of the fiercest and most gruesome rivalries in Hattrick. In the 14 times the two clubs have faced each other 21 players have picked up injuries and referees have handed out 30 cards. In the past four seasons both clubs have been challenging for the VI.101 title with Moon Magic winning it two times to Coral Cove's one. Moon Magic currently holds a winning 7-1-6 record against Cove but a -4 goal differential. Many fans blame this negative goal differential on former manager Srecko Trman who, in an attempt to catapult Cove into an auto-promotion spot and rid Magic of their competition, played the reserves in the final game of the season and ordered them to play it cool. Magic lost 0-10 and the tactic failed as Cove still wasn't good enough to promote automatically and they choked in their qualifier. Still, as of late Moon Magic have defeated Coral Cove five games in a row, including a delicious 5-1 victory at the end of season 34 that cost Cove their second straight title and a 1-3 win at Skinner's Park which was an essential win in the club's second title season. Some say that the Boston Red Sox were a big rival for Moon Magic because of two annual Boston derbies but Moon Magic have a strong winning record against the Sox and quite frankly, many think they are managed daftly. Despite their monstrous Fenway Park, which holds a capacity of 37,500, and financial advantages the Boston Red Sox have not won a title since season 26 and many teams have passed them by. It is no secret that all Moon Magic players have a passion for singing. They are not just passionate but also very talented: several players have ultrasonic range and others have such strong voices that they often hear their own echoes 32 hours later after the sound has traveled around the circumference of the globe. This can make back to back home matches very difficult as both teams struggle to communicate over the cacophony. To harness the fire and abilities of the Moon Magic players (and to also make more money for the greedy, mysterious CEO who rumors say spends fortunes on endangered whale oil mints) the club created the Moon Magic FC Music Entertainment record label. Players who deliver a heroic performance are allowed to record a track at the stadium's brand new recording studio. The track will then be released as a single in many countries. Nearly all of the players have strong indie tastes; probably because they lack self-esteem and are not very gentle. Singles are given different certifications by the club based on the perceived level of heroism. The MMFCME certifications consist of Gold, Platinum and Diamond. For the two late goals scored against strong and favored rival Tiko Ttrick giving Moon Magic a surprising win, its first against the club in two seasons. For the entire Moon Magic midfield for their impressive away performance against bitter rivals Coral Cove. The midfield held over 60% possession for both halves which ensured an important win. For the 3 goals that fueled the Moon Magic comeback against Tiko Ttrick which led to the club's first perfect season. For the hat trick, his first, in the win against Polanie Chicago, who were at the time the top team in V.115. For the 2 last minute comeback goals that gave Moon Magic an important win against Glass Jars. Global Magic is a Moon Magic FC sponsored subsidiary for developing young talent from around the globe. The purpose of Global Magic is to discover cheap but talented youngsters from poor clubs and poor backgrounds, train them rigorously and then sell them for a profit. It is expected that these players will also donate portions of future earnings to the club for giving them a future. The venture has been described by many as an exploitation scheme that violates numerous child labor laws. Four trainees have gone on to score 50 or more goals for their teams, the most prolific being American Mike Matthews with more than 60 goals. The most notable trainee is Argentinian De Nadal who won a Golden Boot while playing in Romania. Chilean Kilpatrick though, boasts the highest TSI with one over seventy-seven thousand. While so far the project has brought in millions in profit Global Magic supervisors are more interested in developing a U20 player to raise the project's profile. Moon Magic FC is represented on the youth level by Magic Academy. Magic Academy was formed in season 32 when youth clubs were finally legalized. Despite the lack of reputation that the senior club held at the time, Magic Academy was invited to join the international Bottom Division Federation youth league for its preliminary group round. The Academy represented their country well. They finished first in their group, 2nd most in points in the entire preliminary stages and boasted an impressive 63 goal differential, easily the best among all teams in the preliminary stages. Magic Academy was then invited to the top series of the BDF youth pyramid, the MARS-League, where it currently plays today. Magic Academy shamelessly celebrates all its achievements and honors. Magic Academy did not get off to its best start during the inaugural year of the RM-League. The boys won only one game during the first trip around the table, drawing four and losing two. After a shocking defeat to the league leading Mavericks, Magic Academy was hovering in the relegation zone. Magic Academy would return to Boston the following week and return the favor, pounding Mavericks 4-1. This was the start of a historic run of seven straight wins to close out the season. No team was safe from Magic Academy and some made claims that Magic Academy players were doping. The club kept climbing the table, week after week and soon parents saw that their boys were in a position to attain RM-League glory. With one week to play, Magic was a point out of first place, behind only those damn Mavericks. Magic Academy visited Ally's Accademicals and trounced them 2-5. It was a sight to see. Unfortunately the boys discovered despite their performance, Mavericks had won their last game 8-0 and the dream of a championship ended. It is well known that Mavericks paid off their final opponent, Mladi Udarniki, so that they could win. Mladi Udarniki would disappear from the league immediately after its final match. Magic Academy finished the season in second place with 28 points, a +16 goal differential and the league's best defense which conceded a mere 19 goals. Curtis Henning was the team's top scorer with 10 goals. Henning also finished 3rd in the league in scoring. The second season of the RM-League saw Magic Academy take their football more seriously. The club was now the only remaining American team left in the top league and the American public put a lot of pressure on the boys to win or face deportation. This meant no distractions and no girlfriends. This was disappointing news to keeper Abe Ferguson who had finally landed two girlfriends simultaneously and they both accepted that he was young and still considering his options. None the less, they were heartbroken and Abe saw a small dip in form. The sacrifices would pay off and Magic Academy would win their first 6 games which had made it 13 straight since the end of last season. The last match being a 6-1 drubbing of the German youth club Mavericks, the Academy's biggest rival and reigning champions. At this point trainer Bud German felt the boys had been taking their football seriously and he allowed Abe to once again pursue his womanizing dreams. This would turn out to be a disaster. In their next game Magic Academy fell to Mini Mussen and Abe Ferguson let in 3 goals. He had given up only 4 goals in the first 6 games of the season! This result allowed Mavericks to assume first place on goal differential and trainer Bud German came under enormous fire for undermining the squad's discipline and also for his rumored sympathy for German youth clubs because of his last name. German immediately called a press conference and furiously refuted his rumored German sympathies. No, he did not hold and sympathy for Germany, quite to the contrary! He revealed he carried the pure blood of American royalty in his veins and that one time he cut himself by accident and he saw he bled purple and orange! Some questioned the likelihood of this as Bud German was known to be very nimble and it seemed unlikely he could have ever cut himself. Nonetheless, German cried that it was his love for Magic Academy that had betrayed him! He had shown too much fondness for his boys and had eased up on them, but it would never happen again! The Academy went on to beat Mini Mussen 6-0 and reclaim the top spot on goal differential before traveling to Germany to face Mavericks. The Mavericks-Magic Academy rematch was one of the most publicized events across the world and the press claimed that whichever side came out on top would surely win the league. Mavericks' Hölzles Acker only had a capacity of 300 and so ticket prices soared. Government officials learned that scalped tickets sold for as much as 1.1 million Euros and as little as 1.09 million Euros. Many think these prices and the perfect elasticity of demand after 292 people kept the game from selling out. The Academy found themselves quickly on top after Ernest Mcmahan scored in the 2nd minute on what was described as a "superb strike from the right." 30 minutes later, Mavericks would level to the delight of the rich, drunk German elite attending the game. After their buzz wore off many of them became disgruntled as not a single notable event happened for over 50 minutes. The world's most anticipated youth match, it seemed, was to go down as a boring draw. Bud German will forever be remembered for this brilliant wonder tactic because in the 85th minute some "crappy defending" (as it was crudely translated) led to the young Allen Brown putting his team up top 1-2. The tens of thousands of Magic Academy fans who were watching the game illegally from behind the chained fences began to chant "Hero! Hero!" as the winger celebrated with his teammates. Brown recalled later that "the sound was deafening." Magic Academy had the game in the bag and in the 90th minute Daryl Harry and Ernest Mcmahan both scored to finish their opponents 1-4. Although Mcmahan scored two goals, everyone who watched that game will tell you that Brown was the true player of the game and that the young boy, who had joined the Academy just a month before, surely had a bright future ahead of him. Meanwhile, for Mavericks fans, even the poet Rainer Maria Rilke could not have left them feeling any greater in disbelief. Magic Academy was now in the driver's seat for the league title. Magic Academy continued to win and the boys entered week 12 with the opportunity to clinch the league at home if they won against Seismic Waves. Anticipation among Academy fans was huge and the game sold out in less than a minute. A database error caused over 30,000 extra ticket sales, far more than Magic Field could possibly hope to hold and this left many with disappointment, especially because the refunds were not issued. So with no way to determine who would be the lucky 300 to witness the game, officials created a cross country foot race that would span from Alaska to Boston and the first 300 to arrive with tickets would be admitted. The fans had no choice but to accept this proposal and the week leading up to the game will be forever known for disturbing peace and quiet across the country during this race where there were no rules. Some Magic Academy fans took advantage of this and looted many stores on the way to Magic Field and others committed light treason. Nevertheless all 300 seats had been filled hours before the game which proved to be well worth the trials of character and willpower. Magic Academy dominated with a 4-0 victory and glory was forever theirs. Fans raided the field and hoisted the players above their heads and carried them down to the docks and tossed them into the ocean. When all the players were found they were given bottles of Cristal and the celebration went on for days until the police intervened. Magic Academy had won the league. In the final game of the season Ernest Mcmahan scored a hat trick bringing his season total up to 15 goals. Magic Academy was the only team to keep track of these of goals and so Ernest Mcmahan assumed the Golden Boot giving Magic Academy double honors. Many wondered if Mcmahan would lobby for senior team promotion now that the season was over. Mcmahan put an end to these rumors and said he would attempt to steer Magic Academy to a good start in season 3 before he would ask for promotion. In BDF RM-League season 2 Magic boy superstar winger Daryl Harry won the rare Turkey Leg Award because of his MVP performance during Thanksgiving Day. Magic Academy defeated a vaunted SmartHotspur Boys club 5-2 and Daryl Harry was awarded a team best 6.5 stars for his performance. The Turkey Leg Award is a unique and coveted award. It is so unique that conditions have only been met once in Hattrick's 34 season history. Turkey Leg Awards are only given out to meaningful games played on Thanksgiving, an American holiday which occurs only on Thursdays. Due to the unique structure of the BDF RM-League, which played its games on Thursdays in its first two seasons, Turkey Leg Awards became possible to win. It is believed that Magic Academy is the first club to win and publicize the award. At the start of season 3 many fans found their hearts in a bit of a bind. Many knew Mcmahan had the talent to promote and train with the senior team but at the same time he was a valuable asset to the Academy which found themselves with a very young squad. Mcmahan was keen to recognize that the youngsters needed someone to guide them and ease them into the fierce storm of RM-League competition. He remained for the first two matches, two wins including a 0-7 whooping of the fallen Mavericks. His presence and scoring set the Academy on a clear path as he said goodbye and joined the senior club. In season 3, the RM-League shifted from an international league to a league over saturated with five English clubs. This meant frequent trips and cold weather matches. It also meant the boys were less enthusiastic about away games in exotic countries. England became far too familiar. Never the less, Magic Academy won their first three matches before drawing a strong Schwalbetasaray Juniors side. The club then suffered their first loss to Lunar Juniors YA, in England unsurprisingly, a harrowing 5-0 affair. The Academy lost the cozy top spot to the Juniors with this loss. The club won its next three games, all against English teams, and held a solid three point advantage over the English Seismic Waves with a chance to extend their lead as they would play the Waves next. But Magic Academy once again suffered an away loss, 3-0, in England, and would hold on to the top spot only by goal differential. With five tough matches remaining the Academy was in desperate need of a confidence boost but there wasn't one in sight. In preparation for these tough matches coach Bud German made a bold choice of throwing the kitchen sink at the midfield, asking Allen Brown and Manny Sullivan to abandon width and focus on solid possession. This gambit would prove to be a masterstroke. Magic Academy hosted Lunar Juniors YA, the only other team besides the Waves to beat the Academy. This time it was a different story as Magic Academy seemingly rose from its own ashes behind two goals from Mike Morrell and and another one by the hero, Allen Brown, to secure a 3-0 win. The Academy traveled to Rotterdam for its next match against Schwalbetasaray which drew the club previously. Magic Academy's midfield dominated the game with over 70% possession. Goals from Clark Pederson and Lonnie Mcclelland gave the club a 0-2 win. Meanwhile Seismic Waves lost to Ally's Accademicals which mean that Magic Academy was in sole possession of first place. Another victory, 1-3 over Flashing Blades, meant that with Magic's superior goal differential the club would likely clinch the league with one more win. They would face bitter rivals, Mavericks, possibly for the last time as the once storied club were to relegate at the end of the season. Magic Academy sent their rivals back to Germany pouting after a 3-0 Academy win. Clark Pederson scored twice and Lonnie Mcclelland scored once and all of the sudden Magic Academy had two players at the top of the scorers table. Despite this win an an enormous goal differential, the league had not technically been clinched. Anything could happen but the club truly controlled its own destiny and a draw at Ally's Accademicals would be enough for a second RM-League title. But the game was in England where Magic Academy had lost its last three games so anything could happen. The club traveled with massive support and although the official attendance was only 190 this was because bitter supporters of the Accies refused to sell their tickets to the American supporters. It seemed that last year's runners-up were still bitter. So fans swarmed the chain link fences and overwhelmed the Accademical supporters. Though it was an away game, the Accies had no home field advantage, in fact it was Magic Academy that had the advantage with a record 94% possession! Lonnie Mcclelland put the visitors up early with a 12th minute goal and Spencer Chen's brilliant goalkeeping made sure that was all Magic would need to win. Manny Sullivan finished things off in the 79th minute as he tapped in a repossessed ball ensuring a second straight title for Magic Academy. The young boys, many who watched the club win it on TV last year, had lived their dreams and stepped out of the shadows of such veterans like Ernest Mcmahan and Curtis Henning. They had won the league. The aftermath of Magic Academy's second title was huge. The Academy fans, known for their passion and belligerence, wrecked havoc on the English region Kent. British Parliament estimates that the damage done cost tax payers over 9.5 million dollars. Despite this, Magic Academy fans have yet to be banned from any country in which they have caused damage because everyone knows Magic Academy fans have great smiles and innocent eyes. Lonnie Mcclelland, a striker from Missouri, finished the season with 8 goals and shared Golden Boot honors with Hamilton Radley of the relegated SmartHotspur Boys. Clark Pederson finished with 7 goals and won a Silver Boot. The biggest honor Magic Academy received though was that the RM-League, named initially after the Mavericks (who were relegated), became the MARS-League, known also as the Magic Academy Reigns Supreme League in honor of the Moon Magic FC Youth Academy who held a new record of two youth league titles. Hopes were high for the club’s chances in season 4. With the starting roster of season 3's title winning squad returning many expected that once again Magic Academy would challenge for another MARS-League title. However, things would not work out well for the Magic boys. Magic Academy could only grab one point in its season debut versus the newly promoted German Gottes Kinder. The next match saw Lunar Juniors YA systematically take apart Magic Academy and boasting a massive 231 Hatstats. Already, Magic Academy was in trouble. They won their next match against Schwalbetasaray Juniors only to proceed to lose their next three all against English clubs. In truth, Magic Academy would only grab 4 points from the four English clubs this season. At this time, Magic Academy was in the relegation zone and would stay there for an unsettlingly long time. The next two matches saw the club round the table with back to back 1-0 victories against the Australian Oz Hawks Juniors. But once again they failed to pick up important points against a run of three matches versus English clubs, grabbing only one. Not only that, but the club lost Lonnie Mcclelland, the prior season’s Golden Boot winner, to a season ending eight week injury. Fans were becoming extremely nervous that their club would be relegated from the prestigious MARS-League and therefore they would not be able to watch the games on TV, instead they would have to actually go to the home games. These next three matches were of the utmost importance and the club’s front running fan base was on the line. Magic Academy would respond, grabbing all nine points and dismantling teams the way they had in the prior three seasons. Though for the first time in four seasons Magic Academy did not pick up a single trophy or honor, the club would live for another season in the MARS-League. Collectively, the fan base and administration breathed a sigh of relief. Magic Academy finished in 5th. After the debacle of the previous season, the American media had turned its back on Magic Academy and football in general. If they could not have a winner, they would not cover the sport. And while not covering games, news anchors would frequently comment during dead air periods about how Magic Academy players did nothing but make other people feel bad about themselves. This was a lot to place onto the shoulders of teenagers and so during this time it wasn't rare for players to doll themselves up with make up to feel pretty. The players would later regret this and never speak of this time period again and thankfully for them the media did not care enough to get any of this on tape. It came as a surprise to many when after one trip around the table the Magic had 15 points. The American people immediately began to care about the sport once more, just in time for the Magic to have a "mediocre" run of 5 points after their next 5 games. Next week, however, Magic Academy won and the league leaders, Lunar Juniors YA, lost, leaving the Magic boys four points out of first place, and a chance to play Lunar in Boston for the final game of the season. With only two weeks to go, it proved not enough time to make up lost ground, as Lunar would clinch the title the following week, though Magic Academy finished a respectable runner-up and had restored sympathy for football throughout America. 1 YL I 2nd 28 14 8 4 2 35 19 +16 Curtis Henning led the team with 10 goals. Magic Academy demands excellence from all its students, but these young players are consistently receiving 5 or more stars. Henning is a legend among Magic Academy fans. He was the only neighborhood kid to maintain a place on the team, a place he cemented with inspiring performances. In Magic Academy's first season in the RM-League, Henning finished third in goals with 10 and won a Bronze Boot. He graduated to train with the senior club as the Academy's 2nd most prolific scorer. Dove anchored a legendary midfield along with Clifton Lovell and Ernest Mcmahan for three years. He started nearly his entire career before being replaced by youngster Clark Pederson a few games prior to his graduation. He is the first Academy player to play overseas. Curley was part of a terrifying defense that allowed only 13 goals during the 2nd RM-League season, the fewest ever conceded. 13 was also Curley's number and some suspect he purposely let the Geneva Seahawks Juniors score the 13th goal in the final game of the season to leave a lasting coincidence in the Academy's record books. Curley became the first Academy player to score a league goal for the senior club. The goal came as part of a 37th minute double-shot-score against FC Friendswood. Curley was eventually transfered to a series III Italian team. Some Magic Academy fans say that Clifton Lovell was never truly appreciated during his time with the youth club. He was part of one of the most fearsome midfields in RM-League history but standout Ernest Mcmahan received nearly all the media attention. Despite this, Lovell never found jealousy in his heart and will always be remembered as a true team player and of course an RM-League champion. His revealed skills came as a surprise to many when he was finally promoted. He boasted excellence in playmaking and a TSI of 1,590 at 18 years old. Daryl Harry was the Magic Academy's first true star winger. He was a steady player that very often kept to himself. He started on the right side nearly his entire stay at the Academy. He is famous for winning a unique award in Hattrick, the Turkey Leg Award, when he was named the MVP of a RM-League game on Thanksgiving. Harry was a mentor for Magic Academy's hero, winger Allen Brown. Many Magic Academy fans will tell you that that Ernest Mcmahan was the best player to ever don an Academy shirt. Mcmahan was born in New Jersey where he was discovered when he was 15 years old by scout Richard Fortin. Fortin had been praised for finding a lot of talent in New Jersey but Mcmahan was easily his finest discovery. Almost instantly Mcmahan found himself anchoring the midfield where he would become Magic Academy's all time leading scorer and win a Golden Boot as well. He also was known as a strong leader and he was the club's first captain. Many in the footballing media compared him with Steven Gerrard although many Academy fans scoff at this comparison as Mcmahan is not a cheat. Mcmahan was promoted to the senior squad two games into season 3 where he had already scored 3 goals. As a young 18 year old he boasted excellence in playmaking and a TSI of 1,790. Ferguson was one of Carrol Lincoln's first discoveries for the Academy and soon the 15 year old found himself starting in the net. Coach Bud German often persisted that Abe desperately needed scoring training but Magic fans will tell you his true calling was as a stonewall keeper. During his career he gave up an average of only 1.12 goals a game in the incredibly offensive-minded RM-League. Sydney Padilla was Magic Academy's first ever recruit. Early, not much was expected of him as he started at forward but never showed the star ability that his partner Curtis Henning did. It was not till a friendly when he was randomly assigned as a wing back did Sydney flourish. He established himself as one of the teams best players. He played in 3 RM-League seasons and the qualification round. Sydney Padilla promoted less than a week before his 19th birthday after a loss against Seismic Waves that left the RM-League title completely up for grabs and the Academy's confidence in shambles. It was an unfitting end to his great career. He left the club as its 3rd highest scorer. Padilla was sold for $86,000 to the illustrious Hungarian powerhouse garristop, a team with 14 trophies, 4 Magyar Kupas and 2 National Championships, making this the most impressive club a Magic Academy player has ever played for. Mcclelland was the second recruit of the new wave of Magic Academy players that would hail from Vermont. He grew up a farmer's son and many in his family expected he would follow in his father's footsteps. But Mcclelland managed to catch a RM-League match that turned his head. He knew he could only ever be a Magic Academy player. He joined the Academy at the age of 16 and in his first season he inspired many as he led Magic Academy to its second straight title scoring a league high 8 goals in the process. His second season started off with a bang as he scored two goals in his first match. Many expected at this pace he was a sure bet to finish above Curtis Henning in Magic Academy's all time scorers list, but he would only score one more time in a disappointing season for the team and for Mcclelland. In week 9 he appeared to have picked up a slight injury only to later learn that doctors expected him to miss 7 weeks and the rest of the season. He was promoted to the senior squad so he could receive professional care. Regardless of the sour finish, Magic Academy fans know he is a true club hero. Morrell grew up on the rough streets of Montpelier and when he wasn't getting into trouble by smashing windows he was chasing down rabbits and selling them for generic chocolate bars. Morrell never went to school and grew up with no sense of purpose until the moment he lost his virginity, at age 11, when he decided he would play soccer. Morrell began playing immediately, post coitus, and it took only a week for the state to recognize him as one of its finest soccer prodigies ever. By the time Morrell was 16 he was the most sought after player in Vermont and naturally he chose to sign with the best academy in the world, Magic Academy. He started almost upon arrival and quickly was putting up 6.5 star ratings. Morrell was feared by all. Manny was discovered by Magic Academy scouts when they went to Vermont to sign Morrell. The bald child with a permanent frown was the culprit of many inexplicable behaviors, so much so that the phrase "Manny being Manny" was used affectionately dozens of times by commentators broadcasting Academy games to describe them. Manny rarely spoke and often got into fights with the opposing goalkeeper well after the games had ended. He would also scream loudly and violently whenever he was dribbling the ball, a tactic that quickly lost its charm and eventually led coaches to suggest to Manny that he should receive counseling. He never did. Colin Springer was an excellent midfielder. Though, I should call him Mr. Springer as that was his peculiar requirement for signing with Magic Academy. Mr. Springer was known for his maturity far beyond his years. He frequently arrived to practices in a three-piece suit which he colored with silk ties and fancy cuff links. This habit frequently delayed practices as he changed into more suitable clothing. After he left for the senior squad many wished he was but a few weeks younger. A week before he promoted, Magic Academy squashed an Ally's Accademicals squad 4-0, thanks to a dominant midfield, but the next week Magic Academy lost 3-1 against the same Ally's club. These three points would haunt Magic Academy as they went on to finish runners-up, though it was still a fantastic season. Allen Brown is perhaps the most legendary player to suit up for Magic Academy, alongside of Ernest Mcmahan. As a 15 year old, he earned the status of Hero, after he scored the go ahead goal against defending RM-League champions Mavericks at the Hölzles Acker. The thousands of Americans who watched the game from outside the chain linked fences began to chant "Hero! Hero!" and it has become one of the most iconic events in sport history. The goal was one of the most important in the Academy's history and propelled the club to their first league title. Though Allen was not known for his goal scoring prowess like Mcmahan was, he is one of only seven Magic Academy players to score ten or more goals, and most importantly, Allen had a knack for performing his best when Magic Academy truly needed a hero. When Allen accepted his promotion, he did so to a teary-eyed standing ovation from his teammates and coaches. Edgar Bridges is one of, if not the least notable Magic Academy alumni. This belief is widely held, especially by this particular historian. Edgar did have the difficult task of replacing club legend Sydney Padilla, who was beloved by all Academy fans, but Edgar did not make it any easier on himself with his arrogance and gracelessness. Though he had more than a smidgen of talent, Edgar had, and still has, notoriously poor work effort. He rarely showed up for practices on time, if ever at all, and never played his hardest. He would frequently hover between four and a half and five star performances and many fans observed he was lazy during games, often giving up on tackles far before the attacker had even reached him. Many wondered why he kept his starting spot. But, in his last match against Seismic Waves, Edgar put away the go ahead goal in a 4-3 match which ended a streak of three losses to the Waves. After Edgar's promotion he was transfer listed, though it was no surprise that no one found him worth even a grand. Many expected he would be fired but to our surprise and horror, he was given a starting role on the reserve squad. At this point journalist Ted Maul uncovered a shocking secret. Edgar's father, Nash, it seems is a well known acquaintance of Moon Magic's Mysterious CEO. As a favor to Nash, Edgar now receives a weekly salary while playing and traveling with the reserve squad. His father is frequently seen at reserve games becoming very emotional and angry when his son does not have the ball. This page was last edited on 24 May 2010, at 20:31.